The Best First Pet For Your Kids – And It’s Not A Puppy! And I would love to buy them a little puppy. If I wasn’t a single, working mum living in a teeny house with a courtyard, who actually hates dealing with dog poo. So – I did a little digging and heard out about a cute little pet that’s pretty low maintenance. 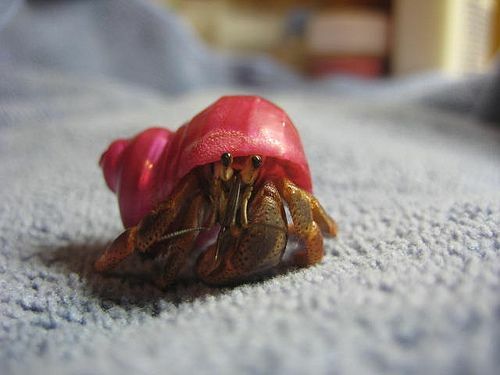 And, wait for it – it’s a Hermit Crab. Yep, really. Kids also learn that all living things need more than just food and water for survival, she adds. How do you look after a hermit crab? They are really simple to look after and there are 4 basic items for hermit crab care. Feeding your hermit crab and providing fresh water will literally take anyone about 60 seconds, making them very easy to care for. Also, in a win for parents, they create minimal mess and are odourless. How long do they live for and what can go wrong? “Like humans, the cold temperatures in winter are when they are most vulnerable, so making sure they are warm is imperative,” she adds. What kind of equipment and housing do you need for your hermit crab? And – one of their favorite treats is popcorn! Find the latest funny pet videos, cute pet photos and amazing pet stories. Curating news of interest to pet parents, veterinary professionals and the pet industry.